Chevron Lubricants provides finished lubricants and premium base oils to commercial, consumer, industrial and marine customers worldwide. Chevron Lubricants has more than 30 years’ experience in manufacturing finished lubricants formulated with premium base oils. From motor oil for the family car to lubricants for heavy industrial equipment, customers across five continents trust Chevron Lubricants to deliver excellent, reliable performance in a wide range of operating conditions. The Havoline brand has provided advanced technology, outstanding engine protection and proven performance since 1904. Havoline motor oils with Deposit Shield™ technology protect engines against harmful deposits, maximize fuel economy and help improve performance. Our complete line of lubricants and coolants – including Havoline®, Delo® and Ursa® products – is sold worldwide under our Chevron®, Texaco® and Caltex® brands. These premium products help improve fuel economy, lower emissions and extend the period between oil changes. Premium products for bumper-to-bumper protection. Delivering quality to customers for more than 100 years. Extreme protection for extreme conditions. Protecting seafaring vessels from stem to stern. With the 2014 opening of our premium base oil facility in Pascagoula, Mississippi, Chevron has become one of the world's top producers of premium base oil. Base oil is the oil used in lubricant formulas before additives are introduced. Premium base oil is manufactured using a process called ISODEWAXING®, which Chevron commercialized in 1993. ISODEWAXING catalysts break down the feedstock, rather than remove the wax with solvents. The end result of this process is a higher yield of base oil that is cleaner, clearer, highly viscous and resistant to oxidation. 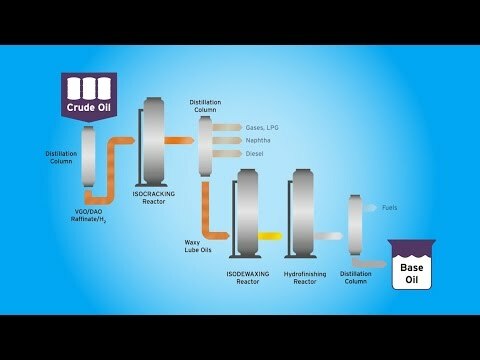 Learn how Chevron makes premium base oil using our patented ISODEWAXING and ISOCRACKING technologies.